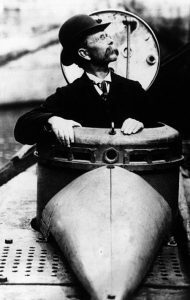 Did you know that an Irishman invented the first modern submarine? His name was John Philip Holland and he was born in Liscannor, Co. Clare, Ireland, on February 24, 1841. He experienced the Irish potato failure suffering poor eyesight as a result. His father was a member of the Coast Guards, and young John inherited a love of the sea. Although his poor eyesight prevented him from following in his father’s footsteps, he developed an interest in ship design. John attended the Christian Brothers School where he came under the influence of Brother Dominic Burke, a science teacher, who encouraged his interest in ships. By the end of the 1850s, John had drawn his first plans for a submarine. When he left school, he joined the Christian Brothers as a teacher. Holland studied the attempts of Bourne, Bushnell, and Fulton at underwater sailing. In 1862, he read an account of the first combat between armored ships: the historic confrontation of the Monitor and Virginia in America’s Civil War and noted English concern since their country’s strength lay in their wooden ship Navy which was now vulnerable. Then, the Union ship Housatonic was sunk by the Confederate underwater craft Hunley. Though it was unstable and sunk with its entire crew, it verified the importance of Holland’s ideas. Unable to promote interest in Ireland, he left the Christian Brothers and came to America in 1872. He found employment in St. John’s School in Paterson, New Jersey. In 1875, he offered his plan for a submersible boat to the U.S. Navy, but it was rejected as a “fantastic scheme.” He was sure if he could raise the money for a prototype vessel, he could convince the skeptics, but money was hard to find. In 1876, as his brother and other patriotic young Irishmen had done before him, Holland joined the Fenian Brotherhood, a rebel organization dedicated to freeing Ireland from British rule. Here he found interest in his plans for a weapon that could sink the British Navy. Delighted with the prospect of striking a blow for Ireland, the Fenians financed Holland’s project. He constructed a prototype and in 1878 the 14-foot, one-man, Holland I slipped beneath the waves of the Passaic River. Impressed, the Fenians provided $23,000 for a full-sized version. 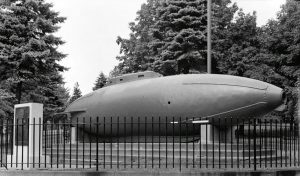 In 1881, Holland completed a 31-foot, 3-man submarine of 20-tons displacement complete with a torpedo tube and fittings for armaments. Spectators stared as the sub went through its trials, and newsmen dubbed it ‘The Fenian Ram’’ in recognition of its origin and purpose. Holland continued to test and refine his design. In 1882, an impatient Fenian leader, John Breslin, stole the Ram and took it to New Haven to be launched; unfortunately, with no knowledge of its operation, it sank, and the project was abandoned. Holland kept trying the U.S. Government, and in 1895, he finally won a $150,000. U.S. Navy contract to build a submarine, but the Navy insisted on alterations which Holland said would make it a failure. So, while building a sub to their specifications, the headstrong inventor also built the 53-foot, 63-ton, Holland VI to his own specifications. After the predicted failure of the Navy design, Holland floated out his alternative vessel. The trials took place at New Suffolk on Long Island, NY and were a total success. In 1900, Holland VI became the U.S.S. 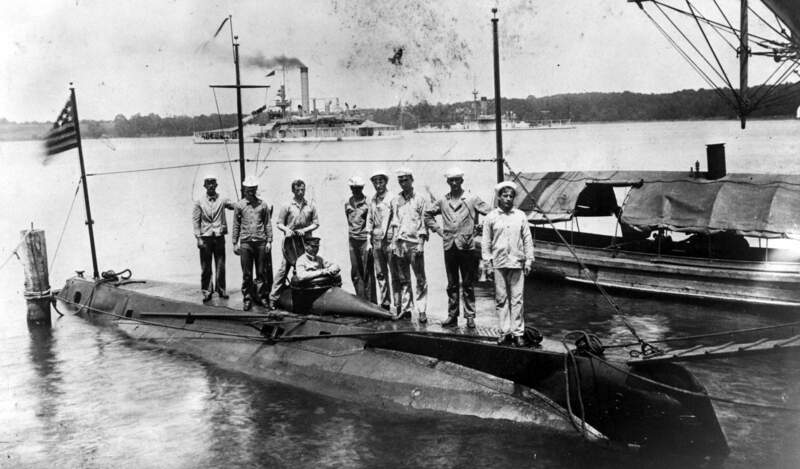 Holland – the first American submarine, and the Holland Torpedo Boat Company received an order for six more. The brainchild of the tenacious Irish immigrant became the prototype for the greatest submarine fleet in the world and financier Isaac Rice, and others backed Holland forming the Electric Boat Company in Groton, Connecticut, later a division of General Dynamics. Rice dealt with both the U.S. and British governments, selling them the original patents much to the chagrin of their inventor and the Fenian Brotherhood. Holland spent years in costly litigation trying to reclaim his patents. On August 12, 1914, he died in Newark, N.J. as the Germans and British were readying their respective Navies for war and the eyes of both fleets were submarines, built with Holland’s principles. John P Holland was soon forgotten. For 61 years, he lay in an unmarked grave until public attention was focused on the historical oversight in 1975 and a memorial headstone was erected. Years later, another was erected in its place, and the original stone was transferred to his home town of Liscannor, Co. Clare and dedicated by the U.S. Navy Submarine Force. As for Holland’s first sub, the Fenian Ram, it would have made Holland proud for it did strike a blow against the Crown; it was salvaged in 1916 and used in a fund-raising campaign for Ireland’s Easter Rising. After that, it ended up in a shed behind the Paterson Museum. In 1988, the office of National Historian of the Ancient Order of Hibernians (AOH) learned of its location and asked the museum its intentions. The museum responded that they had a plan, but a lack of funds kept them from creating a proper display. The AOH sponsored a nationwide fund-raising effort and in 1990, presented the museum with a check for $12,000.00. Today the Fenian Ram can be seen as the centerpiece of an elaborate exhibit to Holland in a special section of the Paterson Museum for he truly was one of the Irish who helped make America great. A long overdue ceremony took place on April 8, 2000, when a monument was also dedicated to the memory of Holland’s accomplishment, at what is now recognized as the first U.S. Submarine Base in New Suffolk, Long Island organized by the U.S. Navy Submarine Veterans.